An extensively updated and extended new edition of this highly successful book on how cancer affects every individual within a family and has a major impact on the family structure itself. It covers a very broad range of topics from sexual problems to how children view cancer (in their parents, their siblings and in themselves). The editors and authors of this second edition have succeeded in providing a refreshing and comprehensive view of the issues confronting families around the world when one of their members is diagnosed with cancer. 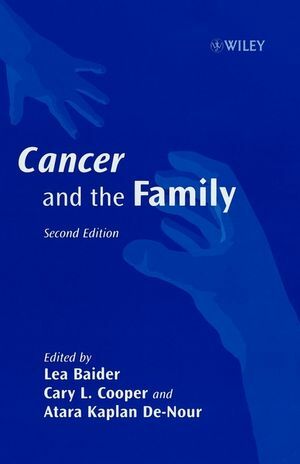 Lea Baider is the editor of Cancer and the Family, 2nd Edition, published by Wiley. Sir Cary Lynn Cooper, CBE FAcSS, is an American-born British psychologist and 50th Anniversary Professor of Organizational Psychology and Health at the Manchester Business School, University of Manchester. Before moving to Manchester he was Distinguished Professor at Lancaster University. Atara Kaplan De-Nour is the editor of Cancer and the Family, 2nd Edition, published by Wiley. Partial table of contents: FAMILIES: THEORETICAL AND METHODOLOGICAL ISSUES. Family Processes and Chronic Illness (P. Steinglass). Family Reorganization in Response to Cancer: A Developmental Perspective (K. Weihs & D. Reiss). SOCIAL SUPPORT AND CULTURAL PERSPECTIVE. The Role of Family Support in Cancer Control (J. Bloom). A Cross-Cultural Comparison of Social Support Among Asian-American and Euro-American Women Following Breast Cancer (M. Kagawa-Singer & T.-U. Nguyen). Culture, Cancer, and the Family (C. Gotay). PSYCHOLOGICAL INTERVENTIONS WITHIN THE FAMILY. Preventing Affective Disorders in Partners of Cancer PatientsAn Intervention Study (C. Pitceathly & P. Maguire). THE CHILD'S PERCEPTION OF A PARENT'S ILLNESS. Blowing Away the Myths About the Child's Experience with the Mother's Breast Cancer (F. Lewis, et al.). Correlates of Self-Esteem Among Children Facing the Loss of a Parent to Cancer (K. Siegel, et al.). DYNAMIC CHANGES IN FAMILIES WITH A CHILD WITH CANCER. Factors Contributing to the Psychological Adjustment of Parents of Pediatric Cancer Parents (J. Hoekstra-Weebers, et al.). 'My Family and I are in This Together': Children with Cancer Speak Out (B. Sourkes & R. Proulx). Sexual Self-Concept for the Woman with Cancer (B. Andersen & D. Golden-Kreutz). Communication of Individualized Cancer Risk Information within the Family Context (J. Bottorff, et al.). Genetic Counseling for Cancer: A Family Issue (E. Bleiker & N. Aaronson). TERMINAL ILLNESS AND SYSTEMS OF BELIEF. The Family in Terminal Illness (S. Wein). Religion, Cancer, and the Family (B. Spilka & S. Hartman). Patient-Family Communication with Physicians (C. Blanchard, et al.). Cancer, Medical Ethics, and the Family (C. Hook).